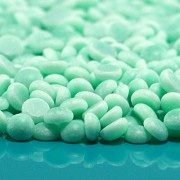 elemelt™ P-2000 Hot-Melt Purge Cleaning Compound is a safe, non-hazardous, highly effective hot melt-cleaning compound. It has a pleasant odor and is environmentally friendly. Use of P-2000 helps reduce downtime and increases productivity. Prevents binding of applicator wheels, erratic pump stroking and loosens charred material. Also prevents nozzle clogging and hose constrictions. P-2000 hot melt purge is designed for flushing reactive PUR hot melt adhesives from hot melt application equipment to prevent the cured hot melt from seizing up the nozzles and curing inside the applicator. Also used for cleaning general hot melt equipment that contains EVA, polyethylene, rubber based PSAs, and polyamides to remove oxidized and charred material. Compatible with Mold Man® 1050, 6000, 6200, 8000, and 8200.